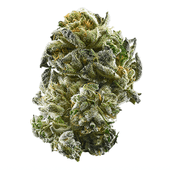 GSC, formerly known as Girl Scout Cookies, is an OG Kush and Durban Poison hybrid cross whose reputation grew too large to stay within the borders of its California homeland. With a sweet and earthy aroma, GSC launches you to euphoria’s top floor where full-body relaxation meets a time-bending cerebral space. A little goes a long way with this hybrid, whose THC heights have won GSC numerous Cannabis Cup awards. Patients needing a strong dose of relief, however, may look to GSC for severe pain, nausea, and appetite loss. There are several different phenotypes of the GSC strain including Thin Mint and Platinum Cookies, which exhibit some variation in appearance and effect. Typically, however, GSC expresses its beauty in twisting green calyxes wrapped in purple leaves and fiery orange hairs. Patients and consumers looking to cultivate this cannabis staple themselves should wait 9 to 10 weeks for their indoor plants to finish flowering. Back Icon Created with Sketch. "This is one of my favorite strains!!! I am a daily user and the effects for me are very strong and intense and, very enjoyable. For me, mostly a head high. It makes me talkative, happy, goofy and generally in good spirits. I could still focus on tasks, as long as they weren't too complicated. For me this is definitely a strain where you want to be in an unstructured or party environment. I would suggest using t..."
"I have an allergic reaction to this strain and have to take an allergy pill to feel better. Crazy. " Get Ready for Leafly Strain Madness 2014!